Turkish tumblers are a breed of bird called takla in Turkish. This breed of bird originated in Mongolia in Central Asia. They first appeared in Turkey in the 10th century as nomadic tribes from Siberia, Kazakhstan and Western China settled in the Turkish regions. Tumblers were kept for the pleasure of the Turkish sultans. As Turkish Seljuks conquered present day Iraq and Iran, then known as Persia, and overthrew the Abassid Empire in Baghdad in 1055, Turkish tumblers were introduced to the Middle East. When the Ottoman Empire was established over the Balkans and Eastern Europe, new breeds of tumbler surfaced in these regions. 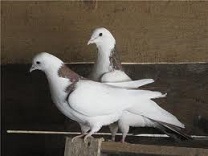 Turkish tumblers are a type of pigeon and are a distinct breed of birds. The tumble is an original breed of bird with variations in the color of its feathers. There are several different breeds namely Mardin, Urfa, Sivas, Ankara and Antalya. The Mardin breed is the largest of all the breeds. It is a low flying bird with blue feathers. The Urfa breed has a long tail, about half an inch longer than the Mardin. It has specific colors called sabuni and miski. The Sivas Turkish tumblers have a much smaller head and shorter legs compared to the Mardin and Urfa. It flies a maximum of 2 hours. It displays distinctive tumbles which are why tumblers got their name. The Ankara tumbler is the smallest bird among the breeds. It tumbles quickly and its performance is harder than the other breeds. The Antalya breed of Turkish tumblers has the highest head and is therefore the tallest among the tumblers. This breed flies much higher than the others and it has swift wing strokes. It is the rarest breed of tumblers in Turkey. Turkish tumblers are entered in competitions that test their tumbling ability. The most popular competitions are where the birds are given 2 hours of flight time. The tumbles done by the birds as they dive towards the ground and begin their upward ascent are counted to determine the champion tumbler. Turkish tumblers are a sleek and beautiful breed with numerous attractive varieties. These magnificent birds are prized for their tumbling performance during competitions. They are an original breed of pigeons which were introduced throughout Eastern Europe by the forces of the Ottoman Empire.